The truth about what happened to Madeleine McCann will come out, Jim Gamble, an expert on online child protection, says. "I believe it's a case where we'll find out what happened to Madeleine in my lifetime," he tells the Belfast Telegraph. "I genuinely believe that. I will always harbour the hope that it's good news." The Northern Ireland man is one of the UK's most experienced and outspoken experts on the safeguarding of children online. He is currently working on a documentary series about the Madeleine McCann case. In a wide-ranging interview, Gamble, originally from Bangor, also talks to the Telegraph about the death of his best friend, a Catholic, when he was just 19 years old and describes the "uncommon valour" he witnessed in his time as a police officer in the RUC. Under the headline: "Outstanding in their field", the Telegraph features a photograph of Karen McAllister from Portglenone, glowing in a sea of 175,000 sunflowers. Portglenone is not quite Provence but the locals can dream. Karen and her husband Damien wanted to help raise funds for their local church, St Mary's, so they planted the flowers and invited visitors. Among them was a woman in her 80s who was almost crying. She had been in France 60 years ago and never thought she would see a field of sunflowers again. So far, this field of dreams has raised £8,000 for the church. There's a Prince fan lurking on the subs bench at the Irish News. Under the headline "Purple Reign", the paper leads with a splash of colour and a half-page picture of the GAA Bredagh team celebrating after their win over Carryduff in the Down Ladies' Senior Club Football championship. But if this is about the glory of the sport, the story underneath paints a bleaker picture. Tyrone GAA legend Sean Cavanagh tells the paper how he struggled as a young man to cope with the huge highs and lows of the game. After the 2016 All-Ireland quarter final defeat to Mayo, he was devastated, he says. He returned home to Moy, left his phone and wallet and just started walking to Benburb. At 1.20am, a taxi driver discovered him in Dungannon and took him home, numb with shock and shivering. Cavanagh tells the Irish News that he hopes his book "My Obsession" will help other young people struggling with their mental health. He also touches on the strong emphasis placed on Catholicism within the Tyrone team. Players were expected to attend Mass before championship games and were given their own rosary beads. The rosary was said before team meals. Cavanagh says he believes religion should be a private matter. Inside, the Irish News carries a photograph of DUP leader Arlene Foster posing with Defence Secretary Gavin Williamson in black and white formal attire at a DUP gala dinner in Enniskillen at the weekend. "Williamson attends DUP gala in secret," reads the headline. The senior Tory attended the event without informing the public or press, writes security correspondent Allison Morris, noting that he is the latest high-profile Tory member to attend a DUP dinner, following in the footsteps of Priti Patel and Michael Gove. 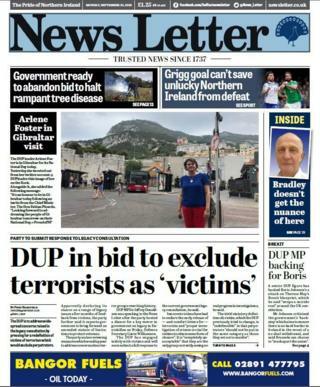 The News Letter also turns the spotlight on the DUP. Its front-page features a holiday-style snap of Mrs Foster "on the rock" - Gibraltar - where she is due to deliver an address for National Day. The paper's front-page story says that the DUP is pressing for "a redefinition of victims of terrorism which would exclude perpetrators". It adds that the DUP is also "reviewing measures which would appear to address concerns about terror groups rewriting history". Inside, the paper quotes Sir Jeffrey Donaldson who says: "The government should bring forward plans now for a new UK-wide definition of a victim with a clear distinction between perpetrator and victim". At the same time, the party wants to protect veterans who have been investigated for shootings which were "entirely lawful". The DUP believes they should not be subjected to "a witch hunt" in their latter years. Also in the News Letter, columnist Alex Kane writes that Secretary of State Karen Bradley "doesn't understand the nuance, subtlety and undercurrent" of politics in Northern Ireland. Before she was given the role, she had never been to Northern Ireland and couldn't even boast a "great great granny twice removed on her father's side" writes Kane. The Daily Mirror reports on the racial abuse suffered by businessman Ali Askir - the founder of the Irish Curry Awards - in Belfast. It happened in south Belfast on Saturday when a group of fans heading to the Northern Ireland match at Windsor Park shouted at him. But Askir tells the Mirror that he wants something positive to come out of it. "The incident was sad but I'd like to make it clear it doesn't reflect true Northern Ireland fans," he says. "Northern Ireland is becoming increasingly multicultural and we need to up our tolerance levels or it will lead to more problems in the future." Image caption Look out Shania... prepare to be "much impressed"
Finally, the Mirror features an interview with Patricia McCluney from Newtownabbey, County Antrim. By day, she's a scientist in a lab coat, "but by night, man she feels like a woman," writes reporter Chris Sherrard. Patricia "swaps microscopes for microphones" in her night-time job as a Shania Twain tribute act. It's her passion, she says. The paper features her in her Twain outfit and also, sitting in her white coat at work, under the caption "a lab-our of love".